Of all of the autonomous regions of Spain, Galicia is considered the most remote and therein lies the charm of Ourense, hidden away longing to be discovered. Galicia has always been seen as a poor rural region, whose economy was dependent upon agriculture and fishing and did not lend itself to modernisation and yet as far as tourism is concerned it is this constant contact with the past that gives the region its appeal and charm. The Galicians are fiercely proud of their culture and language and their Celtic heritage; it is what makes them unique (they feel) within modern day Spain. Galicia always seemed to be a very closed and inward looking area being fiercely resistant to any formal external invasion and in many ways this degree of isolation was very much driven by the geographical location of the region. In what has been a mountain to climb slowly but surely Galicia is now trying to manage successfully the twin track of its regional lifestyle with a much more modern society and thankfully this appears to have had very positive results with regards to tourism with little sign of negative effects.. The less well known town of Ourense is the provincial capital of Galicia's innermost province and can be known in this over the region on the main road leading eastward into the country from the port of Vigo. According to popular tradition than name Ourense is derived from the Hot springs that can be found there and much loved by the Romans who called the town Aquae Urentes (warm waters). The town retained its importance both politically and geographically down through the centuries in various guises leading to the fact that it is one of the four provincial capitals that make up the modern day region known as Galicia. Again likely to one of the most striking visitor attractions within Ourense ease the cathedral. The building work on the Cathedral de San Martino was started in the 12th century and as a result most of its features are very traditional in a style that has been described as late Roman and Early Gothic. The interior of the cathedral is quite big and long and has been described as quite gloomy by a great many visitors. Ourense is one of those towns that very much still follow the original roman architecture and design with regards to town planning and layout. Other parts of Ourense that are worth taking note are the Praza de Magdalena which is just off the main square and is characterised by beautiful overhanging buildings and flowers. This square is dominated by yet another church as well as the cathedral and this time the church is the Iglesia de Santa Maria Madre which is an attractive church of Baroque design that is built on the site of an earlier 11th Century original. South of the old town you will find the original hot springs which first attracted the Romans to settle the area. They still pump out water at a healthy 65 degrees so don't keep your hands under the water for too long! 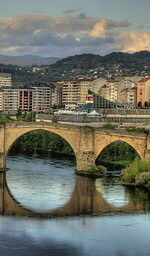 All in all Ourense is definitely well worth a visit. 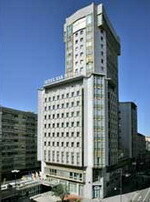 The Hotel Auriense is a modern high rise hotel with gray brick and sculpted glass frontage. It has a wide tree-lined driveway and a fountain outside the entrance. 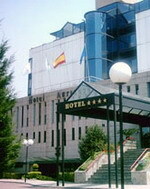 The hotel is located four kilometers from Ourense old town and the Cathedral. 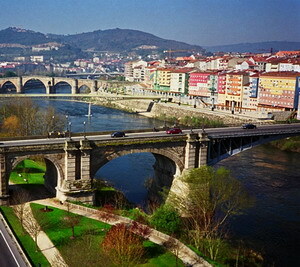 Nearby attractions include Orense's Roman Bridge, which is five kilometers away. 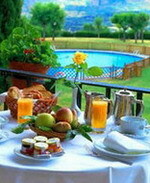 Outdoors, the hotel has a swimming pool including a children's pool and a terrace with chairs and parasols. Guests can also make use of the tennis court, mini-football facilities and garden. The hotel houses its own nightclub, lounge bar and gift shop. For those guests with business needs, the hotel provides conference rooms and a range of audio-visual equipment and secretarial services. The hotel has its own restaurant Enexbre where guests can enjoy a modern menu of traditional and nouvelle cuisine and an extensive wine list. Vegetarian and children's menus are also available. There is also a cafeteria selling a selection of snacks and sandwiches. Offering comfortable accommodation and convenient facilities, the GH San Martin Hotel provides you with all of the quality amenities to make your stay a memorable one. Located in the heart of the city, the GH San Martin Hotel Ourense is a perfect place for you to reside and explore the surrounding areas. You can dine at the onsite restaurant that serves a variety of delicacies. You can unwind at the bar after a tiring day along with a fine drink. A well equipped business centre as well as conference facilities are available for people travelling on business purposes. Guests arriving with their own transportation can avail of convenient parking facility on-site. The hotel has comfortable guestrooms that are well furnished and equipped with modern amenities. Attentive room service is also available for your convenience. 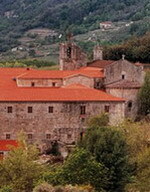 This Benedictine monastery in the middle of the Ribeira Sacra, an area of outstanding natural beauty where the rivers Miño and Sil meet, is one of Galicia’s monastic centres and now a holiday highlight. The existence of the Monastery has been proven in the 10th century, although its origins appear to be in the 6th and 7th centuries. In the monastery styles range from Romanesque to Baroque, with three remarkable cloisters (Romanesque, Gothic and Renaissance). 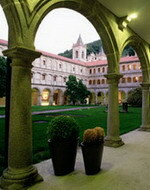 The Hotel has a total of 77 rooms distributed around three cloisters of different styles and periods. The rooms are particularly interesting as they are all different, some with impressive views over the landscape and the valleys of the river Sil. The Hotel has a restaurant with terrace by the chestnut forest, a café with terrace in the entrance cloister, lounges and beautiful gardens. The hotel also has a relaxing spa. The restaurant offers river products, thanks to its position, and traditional Galician dishes, with the local wines taking a starring role. Verín - Verín is a town of services with declining agricultural activity. 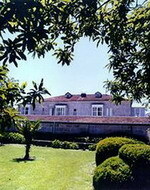 There is a denominated wine region - Monterrey - located in the surrounding area. Carnival here is one of the most original in Spain with masked figures running through the streets brandishing whips and making an interesting sound caused by cowbells tied to their waists. Everything has a medieval air, with little influence from the Brazilian-style carnival, which has become popular in other Spanish and Portuguese cities. Verín has one major tourist sight, which is Monterrey Castle, a huge complex looming over the rather non-descript urban area. Opposite the medieval fortress of Monterrei, the structure is like a pazo, the typical country house of Galicia, with a crenellated tower, lovely views of the castle, Verín and the prestigious vineyards of the valley. Some of the hotel bedrooms have views of the swimming pool and gardens. The cooking of Galicia is full of delicious treats - A few examples: posta de bacalao (cod), beef Galician style, lacón con grelos (boiled ham and greens) and of course, caldeirada de merluza (fish stew), all accompanied by the exquisite fogaciños (a local kind of bread). And to finish, delicious filloas a la crema flavoured with eau-de-vie. These must be tasted.